Nightcliff is a northern suburb of Darwin in the Northern Territory. The area has a young, transient population where many residents come and live for only a few years before moving on. With an Air force base, a Navy base and the Robertson Barracks Army base nearby, the capital is home to a significant amount of military activity. St Peter’s Nightcliff is part of the Anglican Diocese of the Northern Territory. 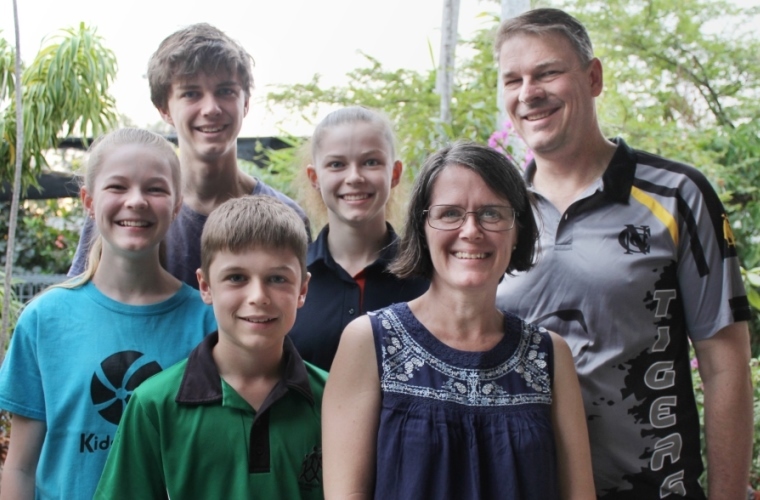 The Chapmans have lived in Nightcliff since 2008. Bruce is the Diocesan Youth Minister of the Northern Territory. His role is to encourage, support and help build up youth and youth leaders, so that they are growing in their relationship with Jesus and reaching out in mission. Apart from encouraging youth ministry throughout the Northern Territory, including Arnhem Land churches, Bruce also works part-time at St Peter’s Nightcliff in youth ministry and training. Pray for the seven youth attending the KYCK youth conference from 12–14 April. Pray that Matthew, Laura, Felicity and Oliver continue to grow in their love for Jesus and remain keen to tell others about the great news of salvation in Jesus. Continue to uphold the family in prayer as Bruce receives palliative care for his melanoma.